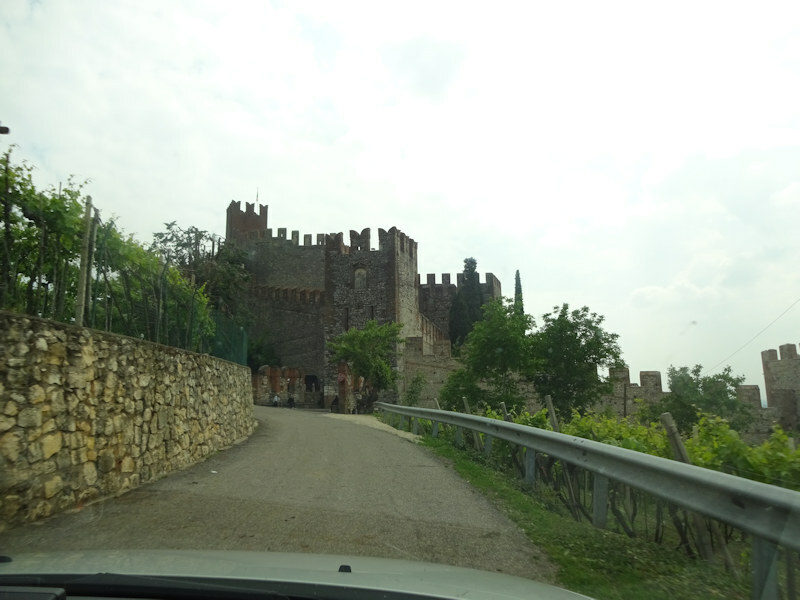 On the autostrada west of Vicenza, we're on our way to the Castello Scaligero di Soave, 14 May 2016. That's not it. 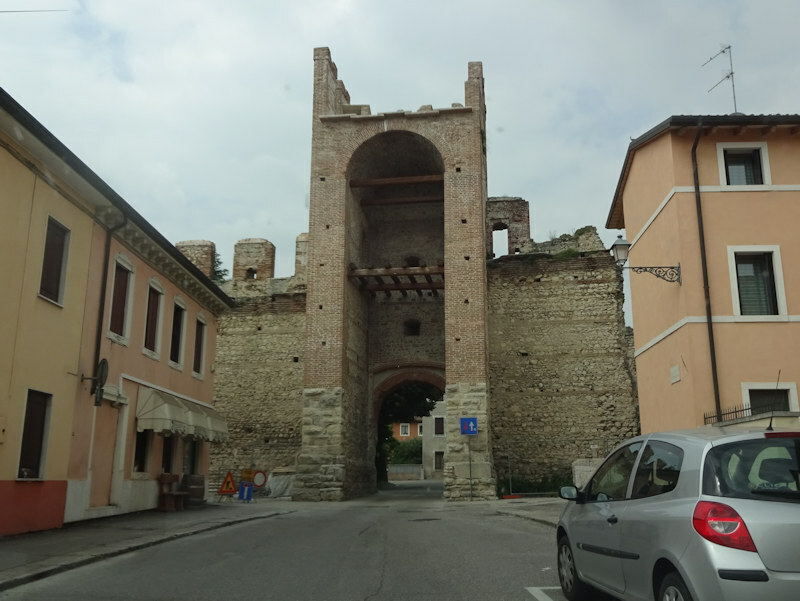 One of the city gates. 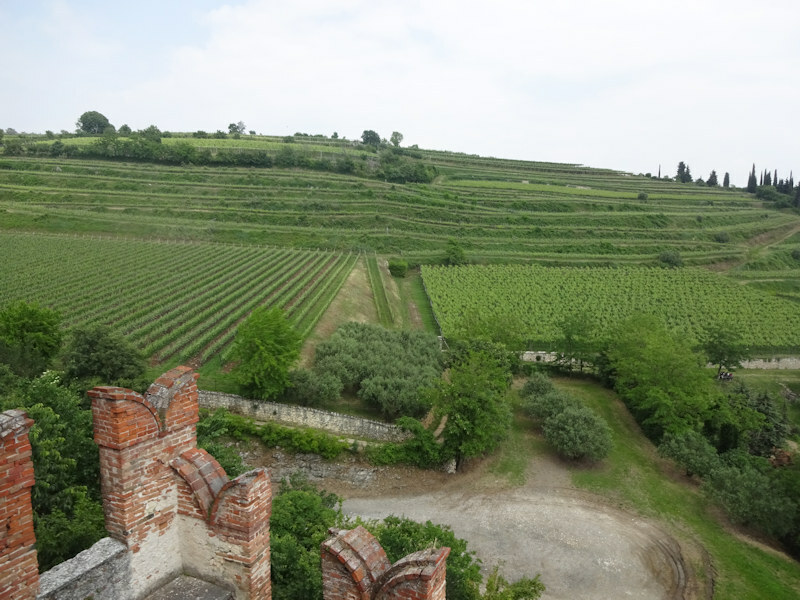 The site of Soave, like Verona and others in the area, was well-placed to help to cover the approaches onto the Lombard Plain by uncouth raiders from the north and east. 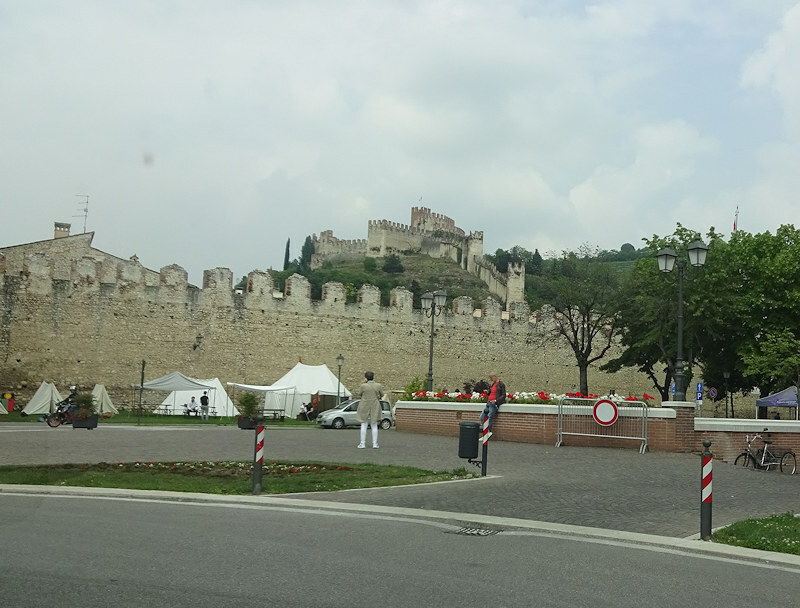 The presence of a castle here is apparently first attested in 934, at the time of the Magyar (Hungarian) raids, perhaps commissioned a bit earlier by Berengar I of Friuli, King of Italy. 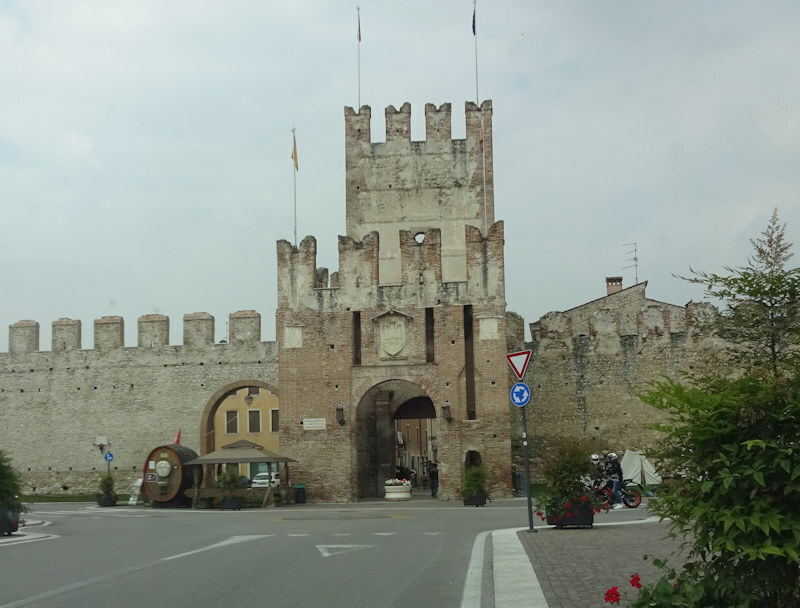 Another city gate. 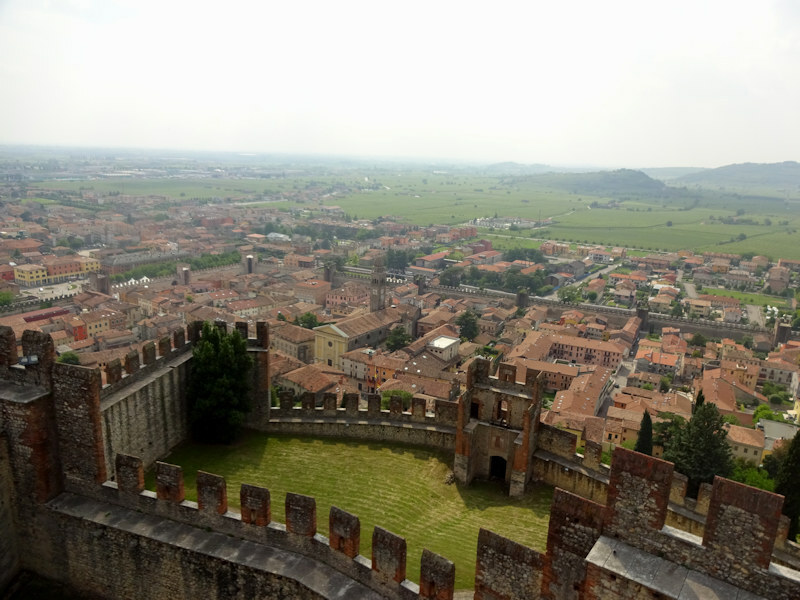 The first lords known to have been residing in the castle were from the San Bonifacio family, predecessors and later rivals of the Scaligers for influence in the Verona neighborhood, but in 1226 Ezzelino da Romana took it over, and then in 1237 came a local feudal family, the Greppi, who donated it to the town of Verona in 1270. 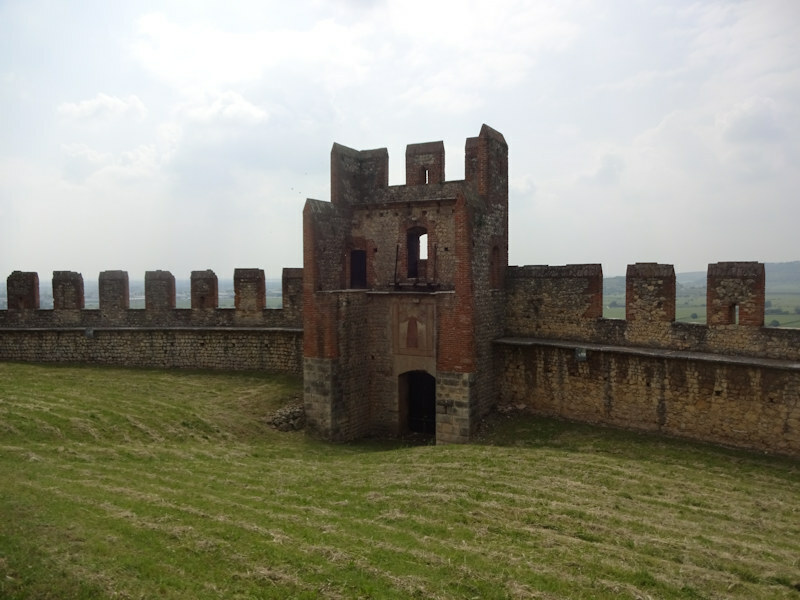 Mastino I della Scala took the site over for the Veronese Scaligers in 1271 and improved the defenses, in the late 13th century, though ownership changed hands again when in 1338 Rolando de Rossi, signiore of Parma, captured it with the help of a Florentine army. Mastino II della Scala soon recaptured it in a costly battle for such a little prize. 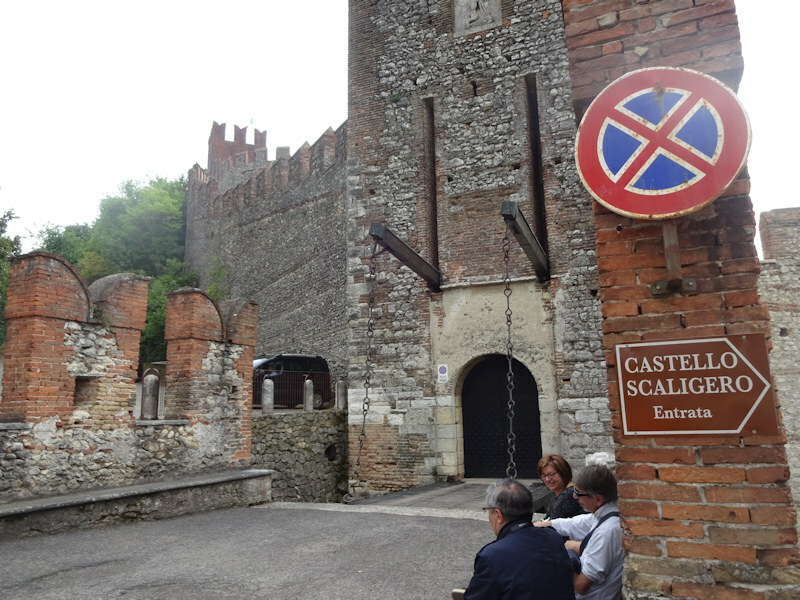 This is the Venetian gatehouse and drawbridge, formerly the main entrance to the castle until the requirements of selling tickets to visit it forced rearrangements. We've finally figured it out, so here we go. A new entrance, probably harder for a bunch of armored soldiers to get through than the main gateway. 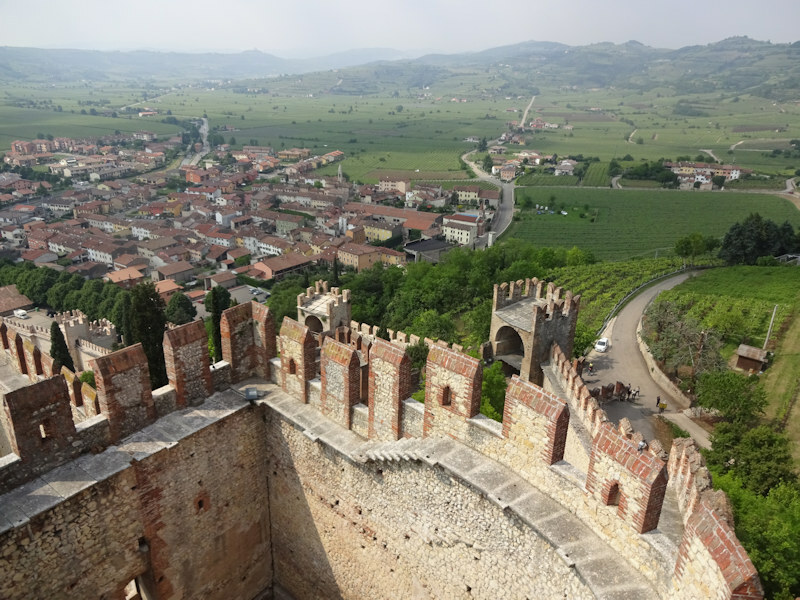 The Scaligers had realized the strategic importance of this fort, just east of Verona, and in 1369 Consignorio della Scala restored and strengthened it, and then in 1375 he added the ambitious town walls that extend down to suburban Soave at the foot of the hill and about 2km of walls and 24 towers around the old village. 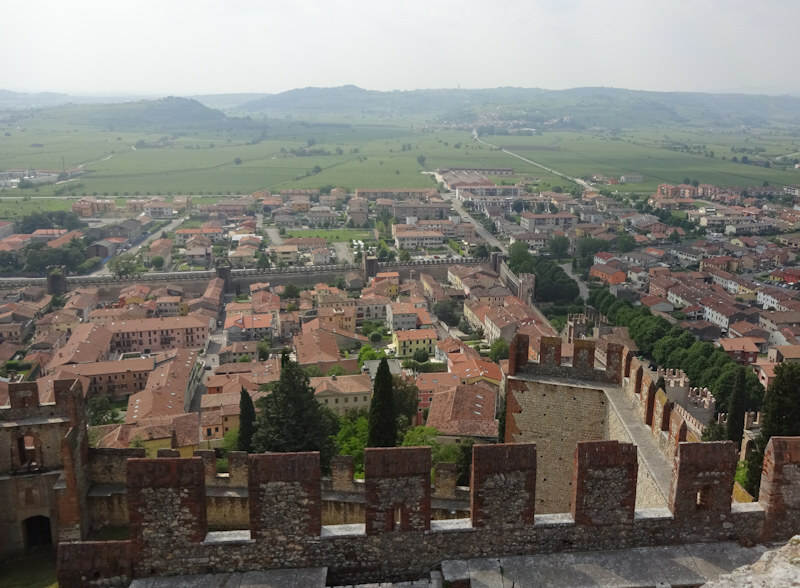 After the decline of the Scaliger dynasty by 1387, the Visconti of Milan and Da Carrara of Padua traded ownership briefly until the Venetians extended their terra firma policy throughout the region, including Verona, in 1405. 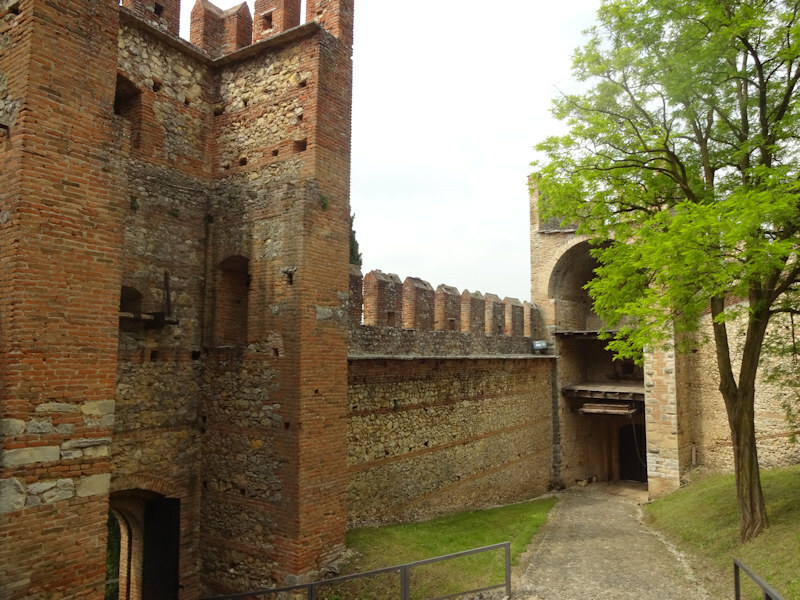 The front gate, drawbridge and portcullis on the right were added by the Venetians as part of this new 'first courtyard'; the gate on the left leads down towards the town, now within the new city wall, and to the ticket office. 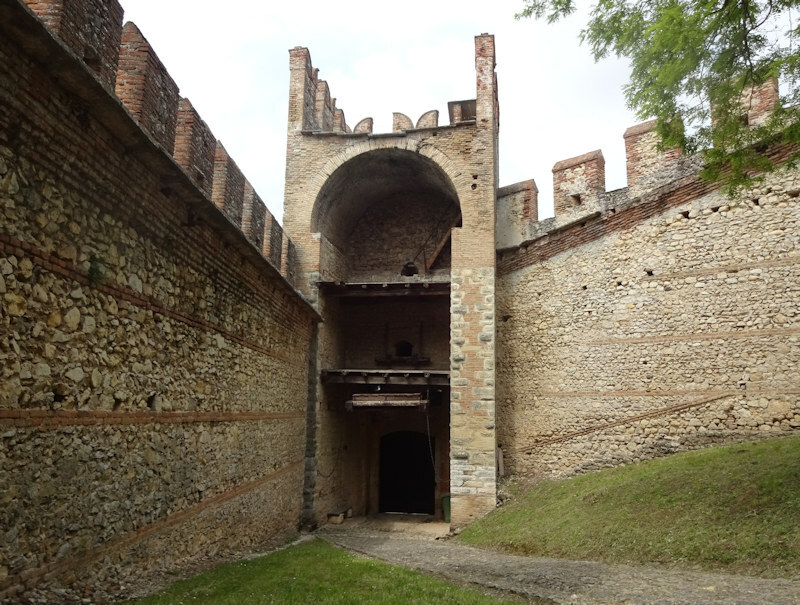 The Venetian front gate, in the "St George" first courtyard, characteristically open at the back and served by wooden scaffoldings that could quickly be removed if parts of the walls were breached. 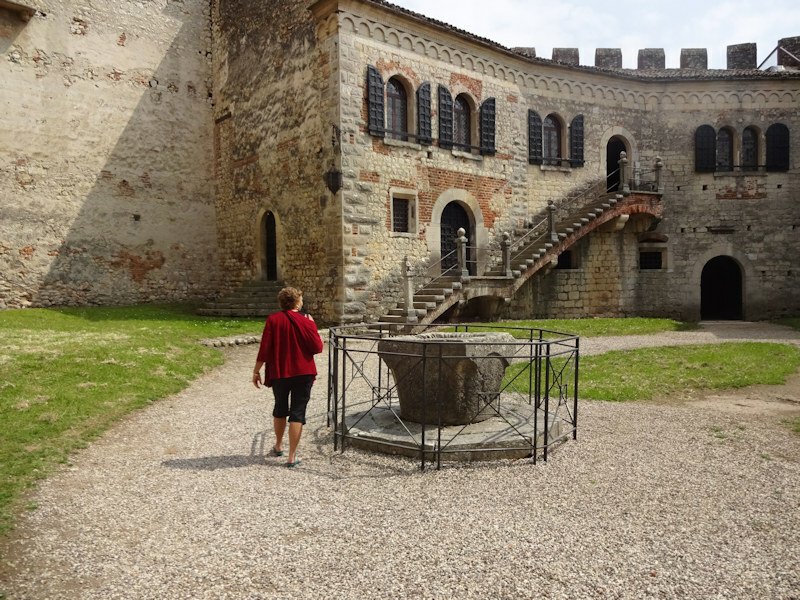 The first courtyard, thought to be where the inhabitants of the village would be stashed in the event of an attack or siege. 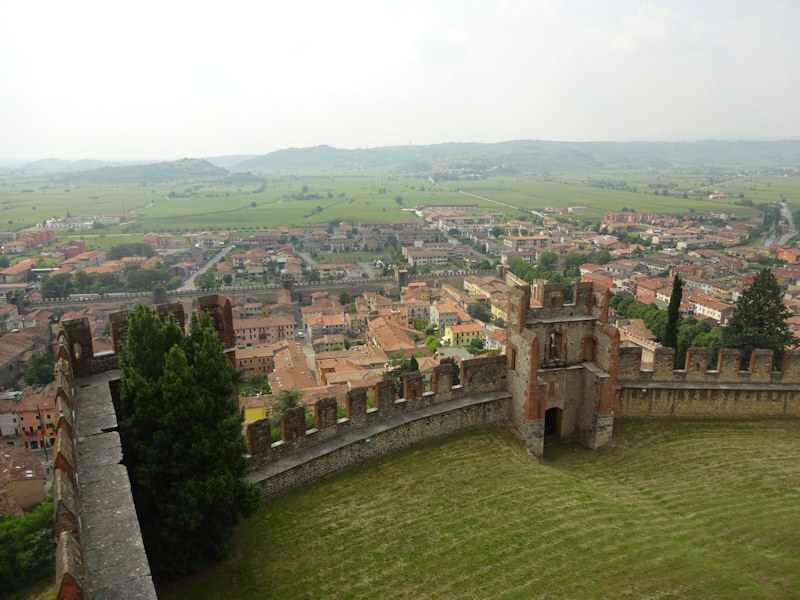 The built level area in the centre was the site of an apparently 10th century church. 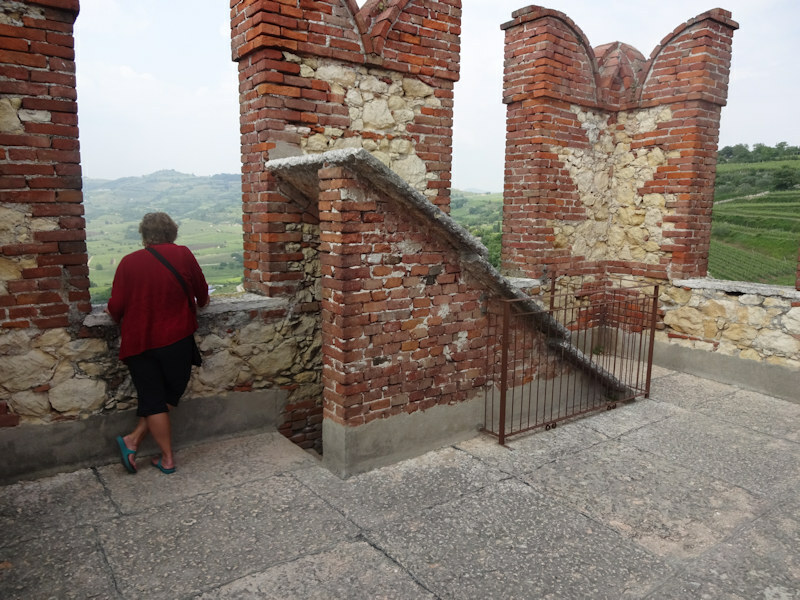 Three tiny apses of the old church outside the original walls. 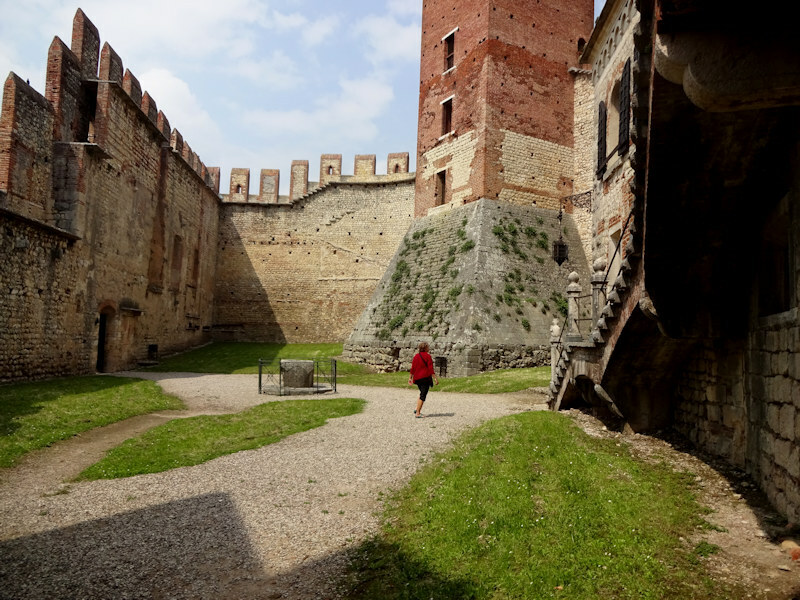 The benevolent 19th century castle-restorer, Senator Camuzzoni of Verona, elected to leave this part unrestored, since there's not enough left of it to guess what it was meant to look like in its prime. 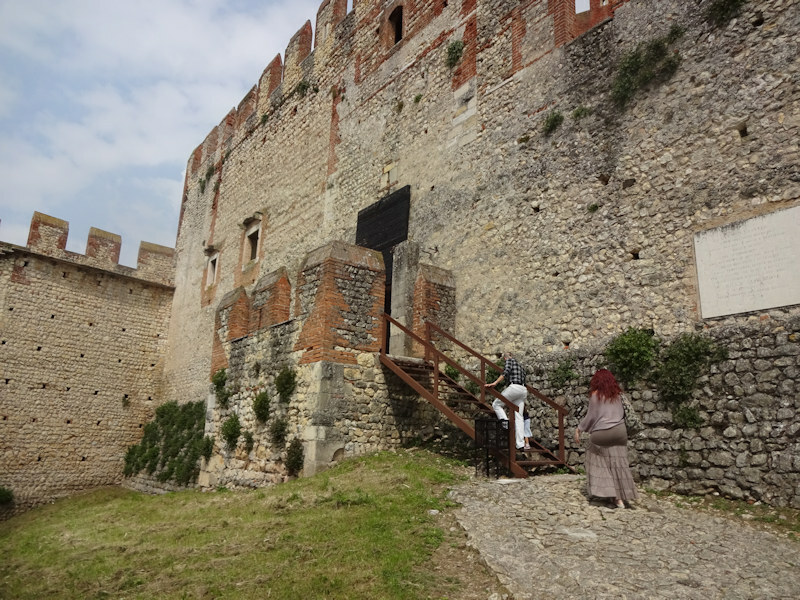 We're through the next gate into the second courtyard, presumably originally populated by cavalry animals and men, if any, with storage sheds and what not. 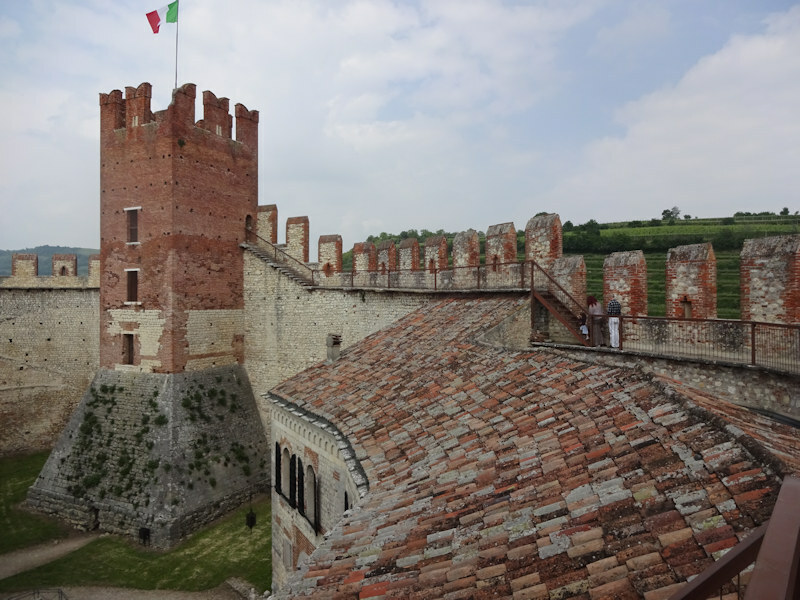 The author of the castle guidebook, Ms Paola Cervato, comments about the cavalrymen and their horses cohabiting so closely together, "The stench was no problem for soldiers, considering they themselves took a bath once in a blue moon". 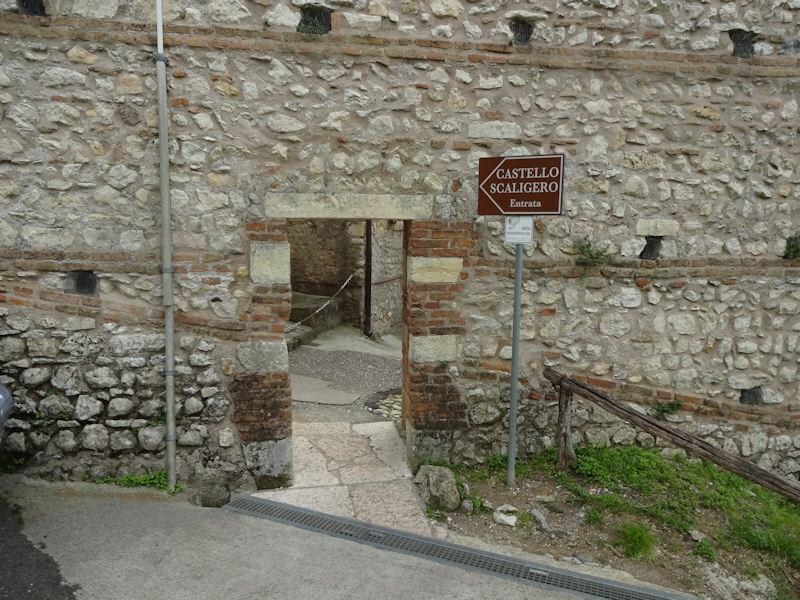 The original front gate of the Scaliger castle, before the construction of the Venetian gate, overlooking the town directly. 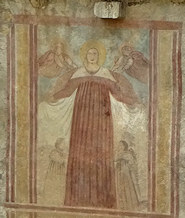 The second courtyard is called the Madonna Courtyard because of this fresco of the Madonna protecting her people, showing the date 1 June 1321. 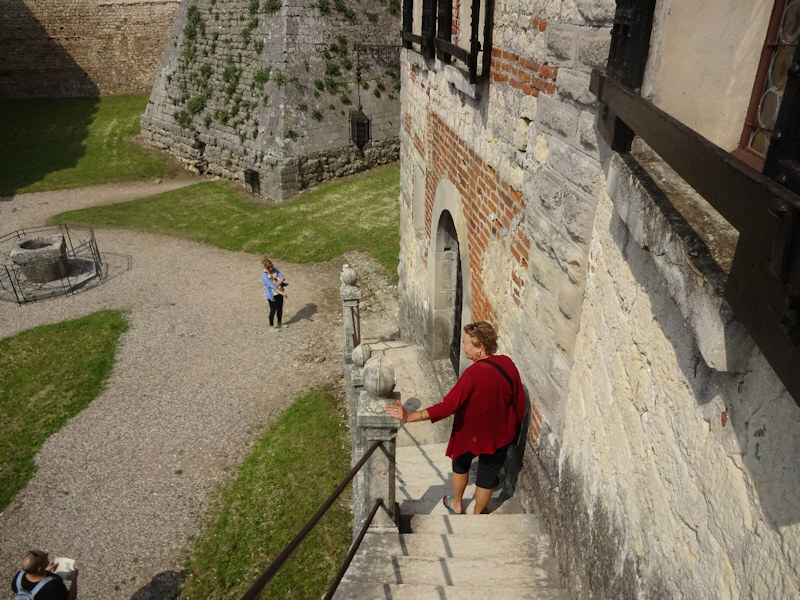 Up to the small door into the inner or third courtyard, with what would have been disposable stairs in case of attack. 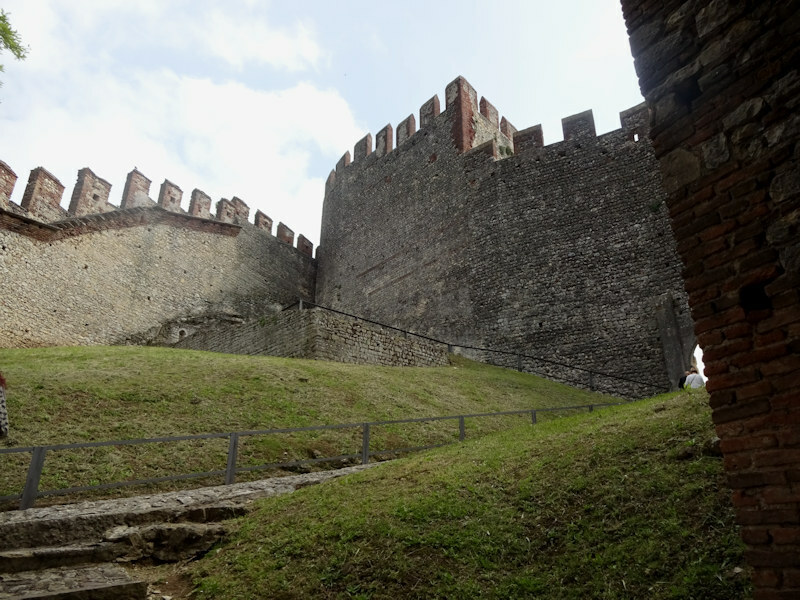 In the centre of the third courtyard, the keep or mastio, with a stone glacis. 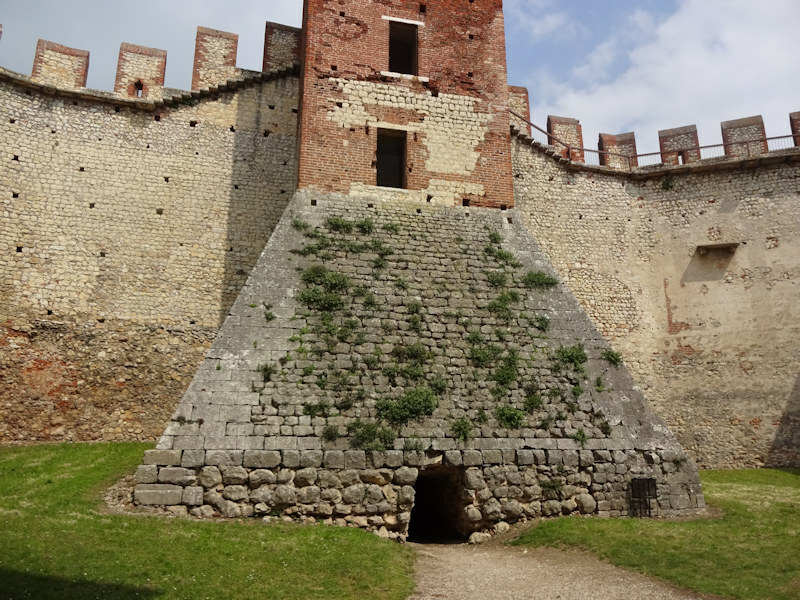 The doorway into the base of the tower is more recent; originally access to the base was only through a trap door on a higher floor. 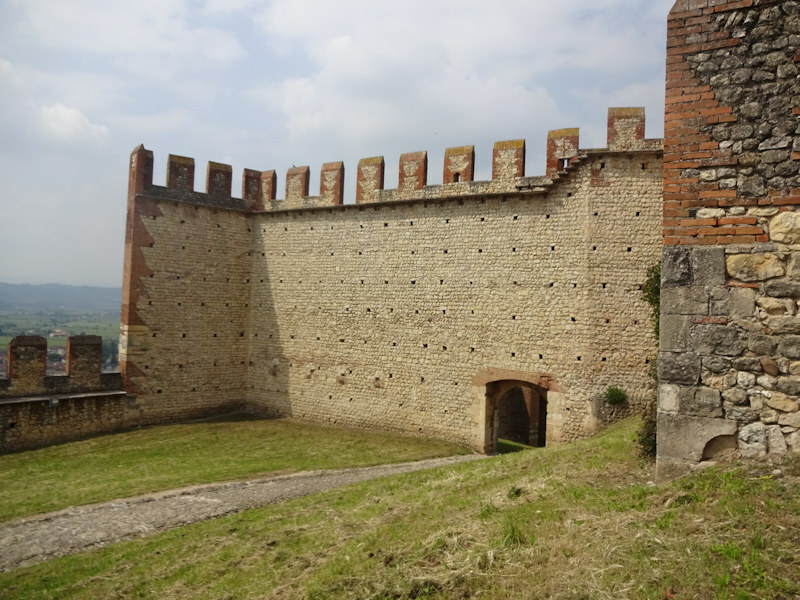 There are legends that prisoners and enemies were thrown down there to expire, and according to Ms Cervato's guidebook explorers of the then-disused castle in 1770, when they dug this entrance out, found a two-metre pile of human bones at the bottom. 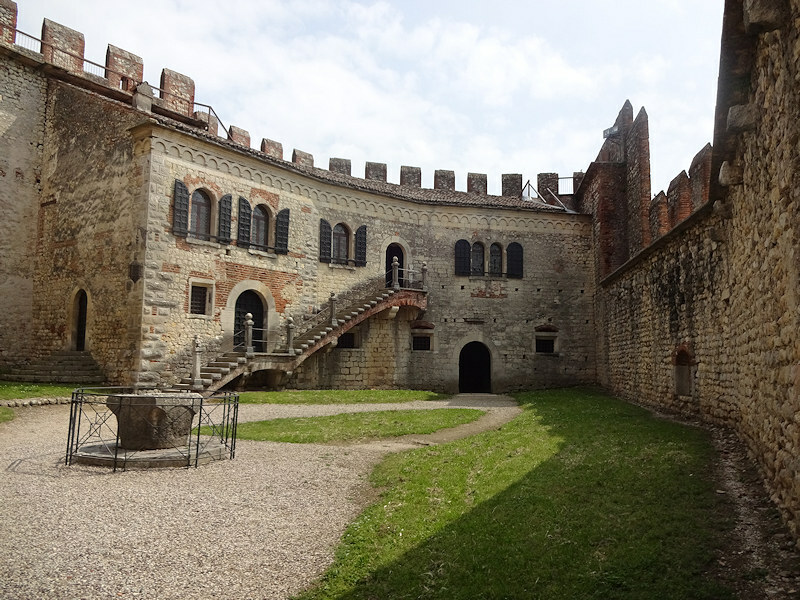 In the third courtyard, that is the residence of the captain or castellan of the castle, up the stairs, and on the groundfloor directly ahead, the living quarters of the small garrison. 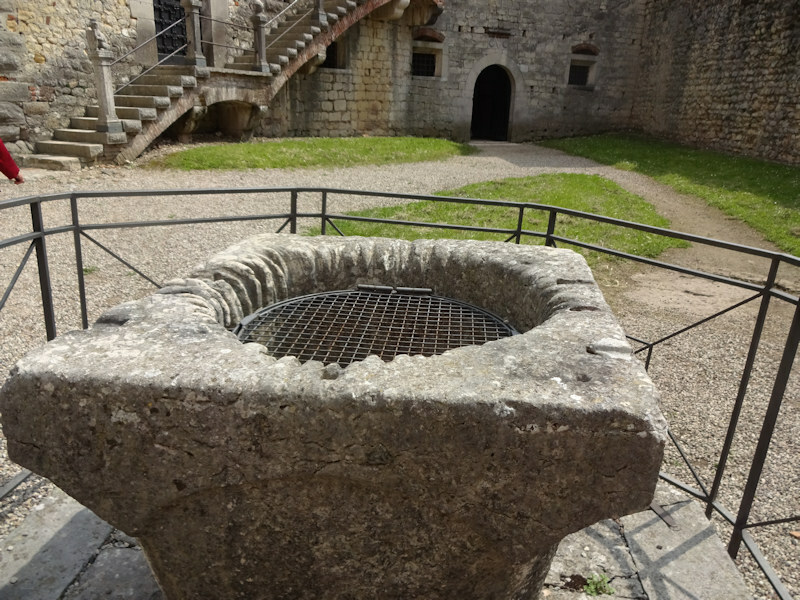 The well in the centre was dangerously close to that 2-metre pile of dead humans, one would have thought. The well's rim is grooved by aeons of ropes hauling up the old bucket. 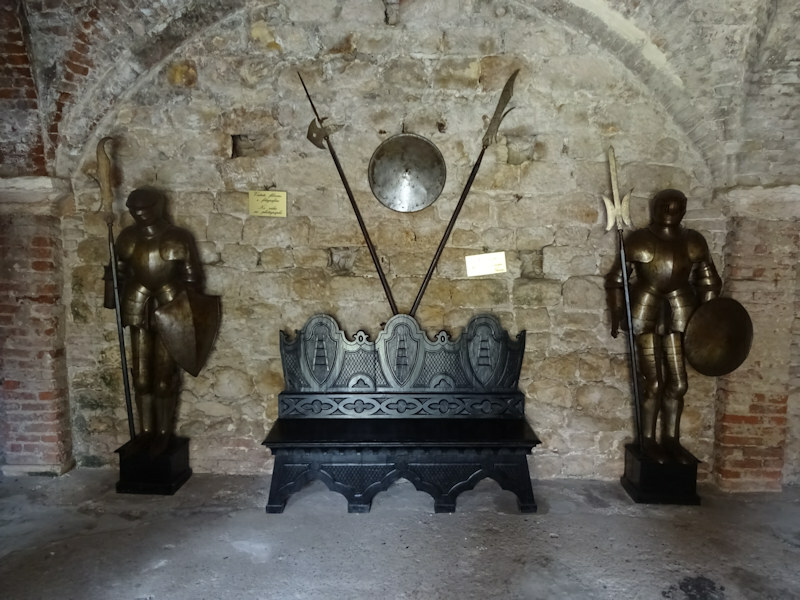 In the garrison room (if that's what it was) below the stairs, it's now been furnished with some interesting museum-type items. Now up the stairs. On the wall on the left, beyond the doorway, is the imprint of an enormous kitchen chimney, presumably where the kitchen would have been, and there other signs around the walls of other facilities, like a forge for making weapons. The emblems of the Scaligers: the heraldic device of the scaling ladder, held by a dog with a crown on; the Della Scala family had a fascination with vicious-but-loyal dogs, from the dynasty's founder Mastino ("mastiff") to their most famous member, his son Cangrande ("big dog") and to most of their successors. 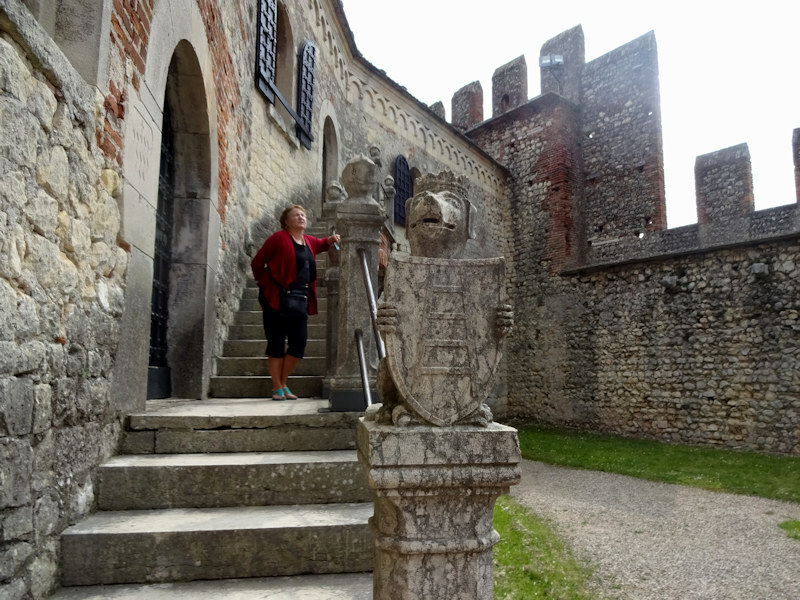 Higher columns are surmounted by helmets with their visors down, but on the column by the top door there is a helmet with the visor raised ('if you're coming in here, I want to be able to see your face!'). 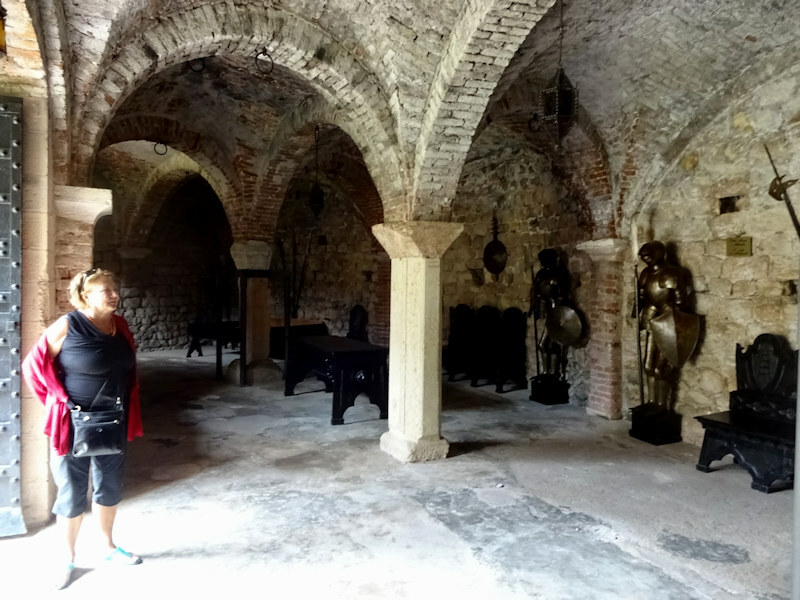 The interior of the Captain's House is a strict no-photo zone, and the nice lady, who we think may have been Ms Paola Cervato, was kindly and informative but vigilant. 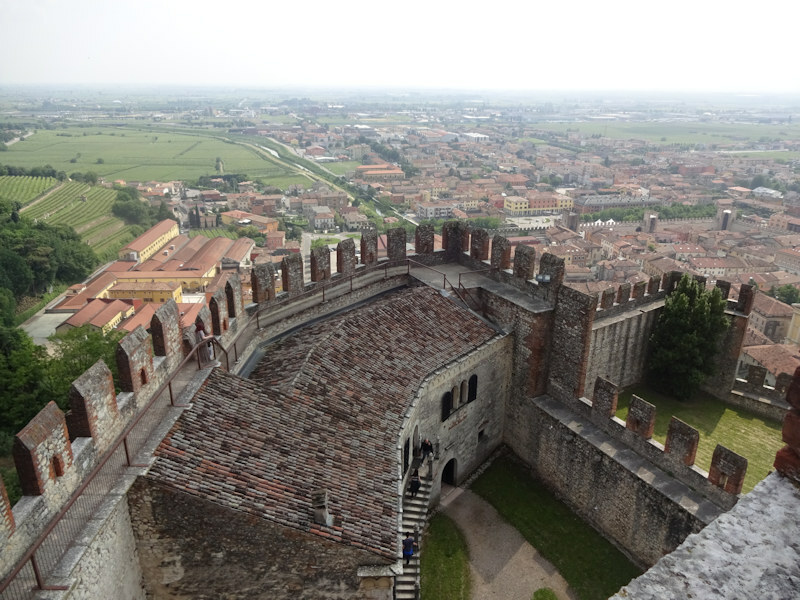 (She wouldn't charge us for the guidebook because, she said, Kristin greeted her with 'salve' instead of 'bongiorno'). 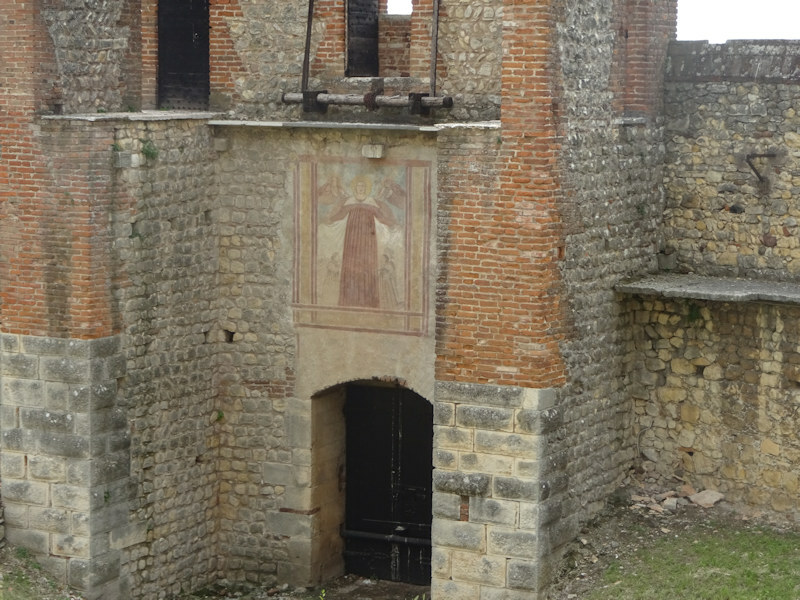 We read in the guidebook and to some extent recall that the apartments included the "Fireplace Room" or livingroom, with original paintings on the walls, restored in 2005, and a family tree of the Scaligeri (a sizable collection of artifacts found during restoration work, like Roman and medieval coins, has been stolen); a fortified "hanging courtyard" out the back for growing medicinal herbs in safety; the castellan's bedroom; a diningroom, which used to have a display of precious household items which are now stored safely away somewhere else; and the "Studiolo" with portraits of top Scaligeri and another of Dante Alighieri, who may or may not have been a guest of Cangrande I in Soave as well as in Verona. 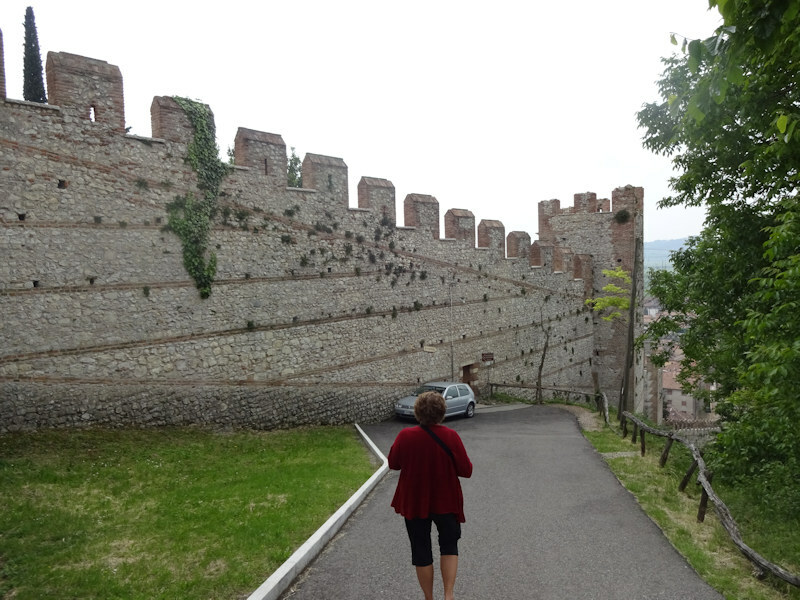 From the Captain's House, we proceed up the stairway onto the wall-walk towards the keep. 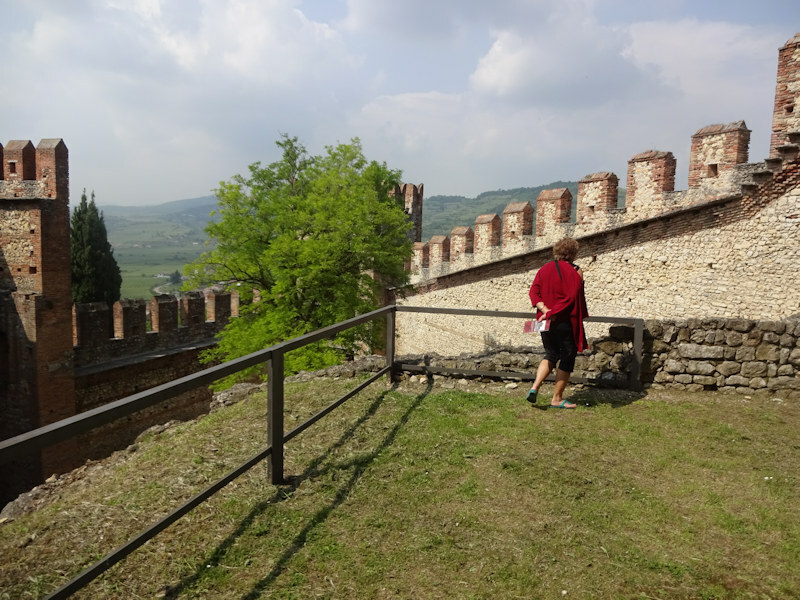 Whilst reading our new guidebook. 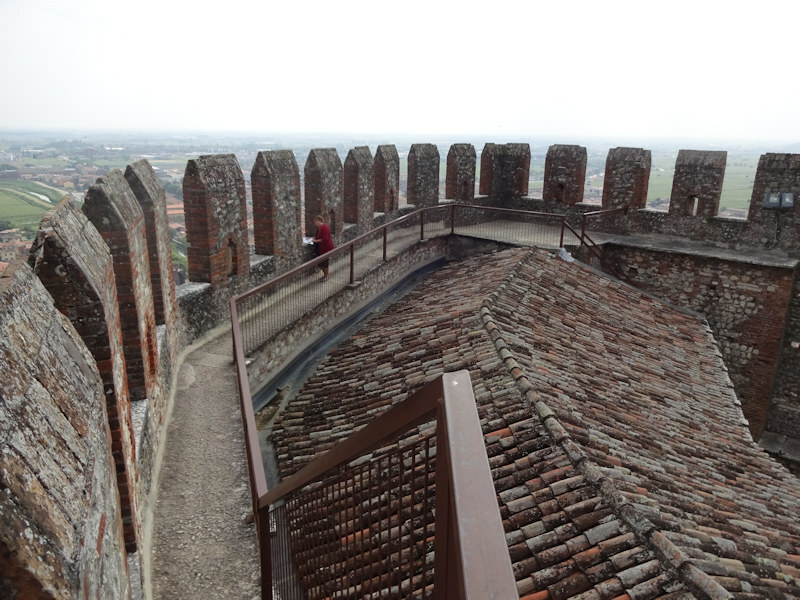 The restored castle keep and roof of the Captain's House. 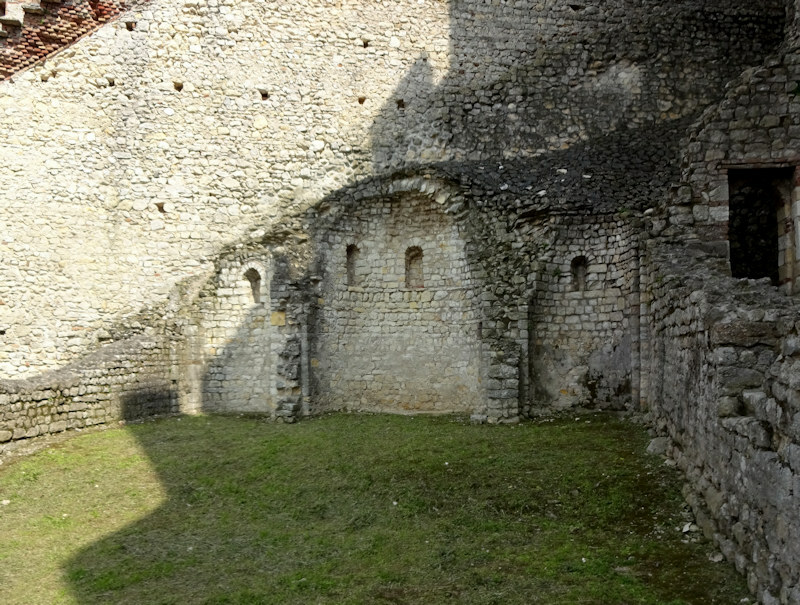 The three windows on the keep are modern. 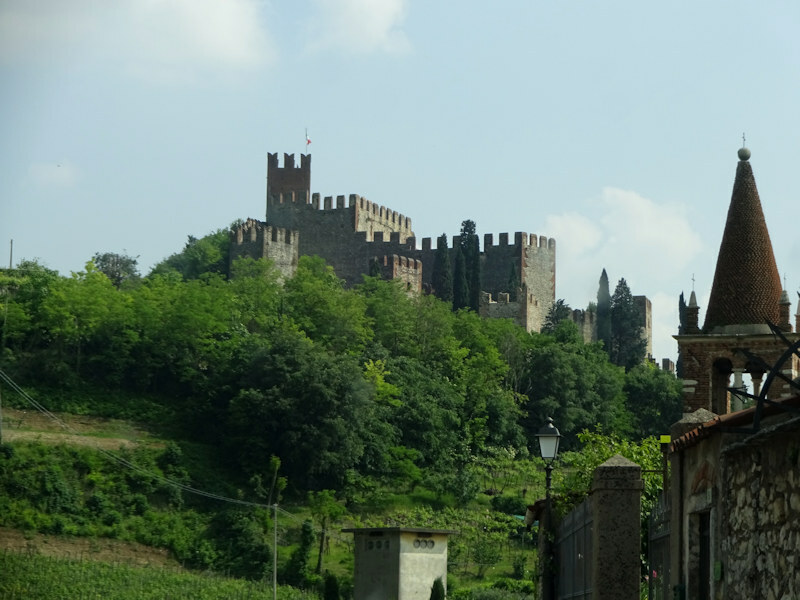 The hillside behind the castle, towards Monteforte d'Alpone to the east, with vineyards everywhere for the famous Soave DOC white wines. 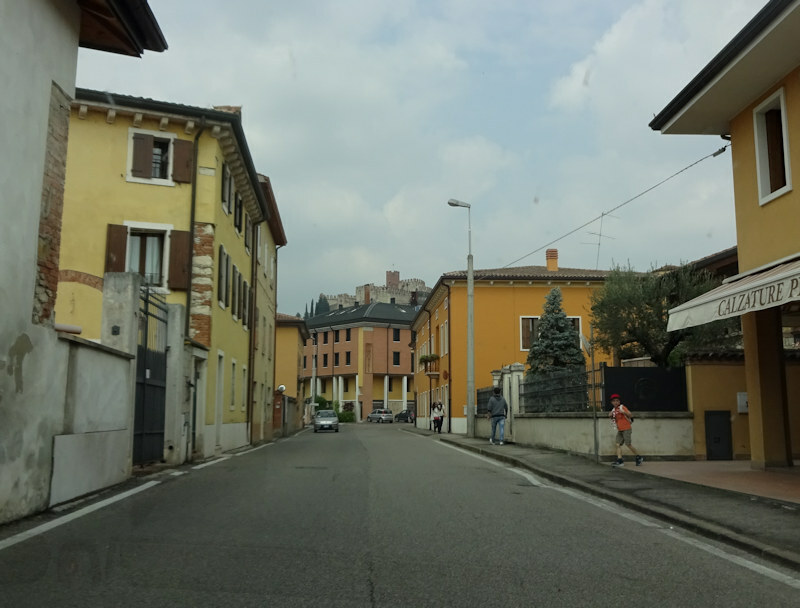 There are number of civic buildings in the town as well, like a Palazzo di Giustizia and a residence of the Scaligeri governors and later the Venetian Capitani, that were commissioned by Cansignorio in 1375. The Captain's House from the keep, and down we go. 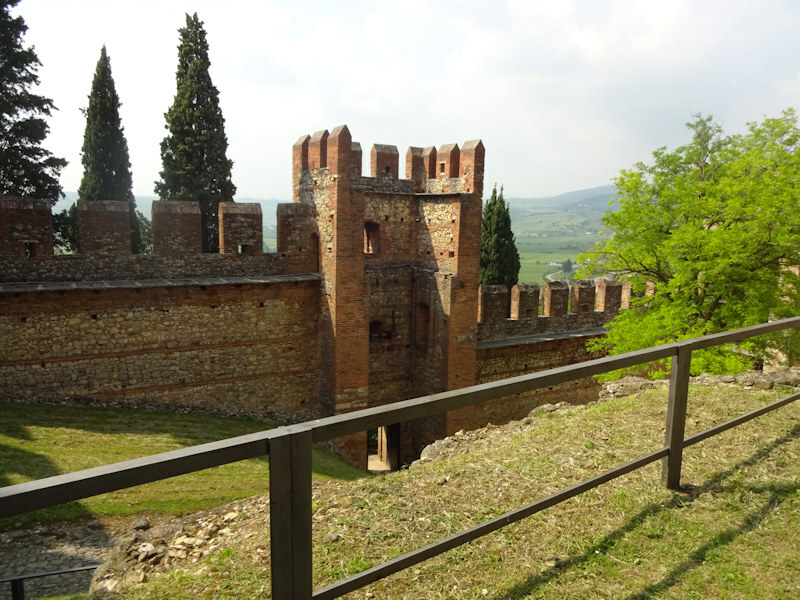 This is the little plateau out in the first courtyard, with the apse-remains of the old church. 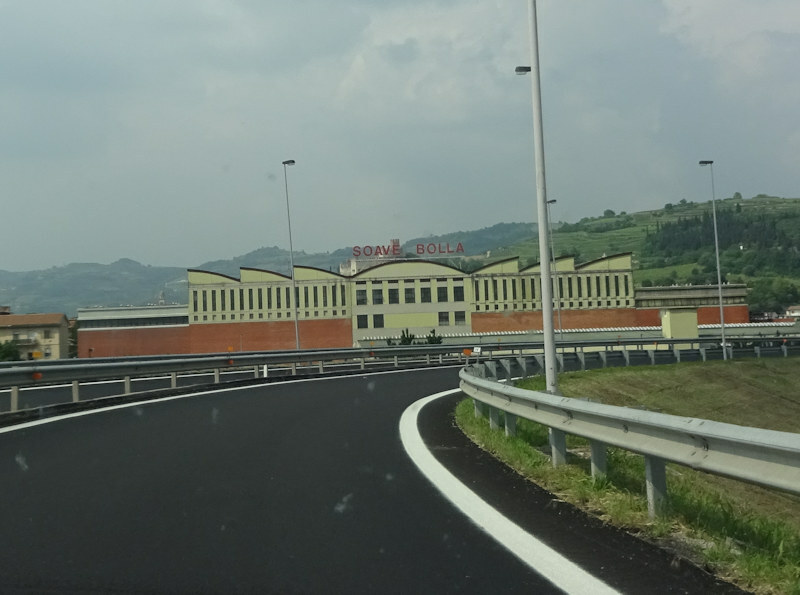 Leaving town onto the autostrada, one is reminded briefly of his long-ago childhood, when Soave Bolla advertisement jingles filled the American airwaves; in the 1970s Soave wines were the most popular Italian DOC wines in the USA, surpassing even Chianti. 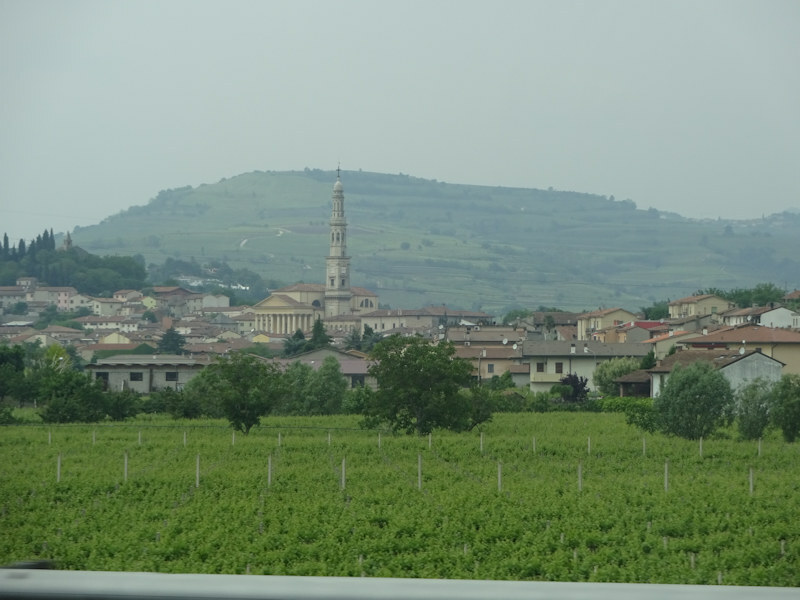 Subsequently, Soave's market share was overtaken by Pinot grigio varieties and a number of new alternatives from southern Italy. Feedback and suggestions are welcome if positive, resented if negative, . All rights reserved, all wrongs avenged. Posted 26 July 2016.